Just because the sun goes down doesn't mean your fun has to stop. With our Enduro Light Kit you'll be able to ride deep into the night. 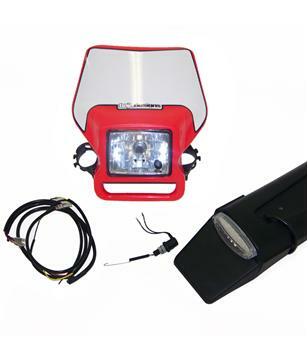 This kit includes a halogen headlight with glass lens, H4 high/low bulb, handlebar switch, tail light, brake switch and mounting straps. This kit also comes with a complete bike-specific wiring harness as well as OEM style waterproof connectors.